Historically, for many organisations, the relationship between Sales and Marketing resembled a battleground - Sales contesting that leads from marketing were woefully unqualified, and Marketing feeling affronted by the apparent lack of effective follow through on their hard won leads. For many, the rift ran deep. Replace the guns and blades with pointed fingers and heated memos, and you’ll have seen this scenario at some point in your career, I can almost guarantee it. You may even feel things aren't that much better today. You know the world has moved on and, according to study after study, buyers are getting a long, long way through the purchasing process before they’re ready to speak with Sales. Worse, they object deeply to being interrupted and sold to before they are ready to buy. Even today there’s often a disconnect between the two departments (perhaps for lack of a harmonised vision around a common cause). And too often the end result is an inherent mistrust where Marketing grows increasingly frustrated and Sales revert to old school cold-calling with predictable fallout. So what in the world is a marketer to do? If you want to break down these traditional silos and bring the two sides together behind a united intent you’ll have to be the emissary of peace and the bearer of true enlightenment. And, this can be difficult, especially if the other side perceives you as the weaker party. You’ll need more than eloquent diplomacy to succeed – more of a literal magna carta for a new age of sales and marketing – a blueprint for SMarketing if you will. Or put another way, perhaps you need a service level agreement (SLA) that defines exactly what you need from each other. Where in the past Marketing has been tasked with serving up large volumes of leads, going forward we need more focus on the quality of leads. After all, there is no more important a commodity to Sales than time. And unqualified leads waste time. Involve Sales in the definition of a sales-ready lead and you will have half the battle won. Align the content you serve up around key questions and objections Sales hears every day and you’ll take another big step towards detente (read advice from The Sales Lion on this). Run closed loop analysis on your old leads and calculate the profitability of each segment to get closer to a workable sales-ready lead definition. Use marketing automation and lead nurturing to further qualify or even disqualify non sales-ready leads. Work with Sales to ascertain how many sales-ready leads they will need Marketing to generate each month in order to meet sales targets. Agree the number and frequency of attempts Sales will make to reach out to these leads. Align both Sales and Marketing around the same revenue goals and you will be creating cohesion around a common cause. Measure everything and be transparent, sharing insight across both teams, calling out success and seeking solutions together to address problems. By creating an SLA between Sales and Marketing you create the foundations for unity which will engender a new inertia where old battles are laid to rest and both departments coalesce around a common goal – SMarketing. If you are at all unsure about how significant this shift towards new ways of selling have become, it is enough to look at the explosion of books on the subject. Two in particular that I would recommend are Frank Belzer’s Sales Shift which focuses exclusively on how inbound marketing has turned sales upside down making it more difficult and more lucrative at the same time. The other is Daniel Pink’s To Sell is Human, described as ‘the surprising truth about persuading, convincing, and influencing others. To name check a couple more from notable writers there is UnSelling by Scott Stratten, the author of UnMarketing and The New Rules of Sales and Service by David Meerman Scott, the author of The New Rules of Marketing and PR. With some great minds in modern marketing echoing the call, you can see why it is more important than ever to rally the two sides to the SMarketing cause. There are clear strategic spoils to be enjoyed by Sales and by Marketing, through developing a mutual understanding of how to align working so that the efforts of one informs and facilitates those of the other. 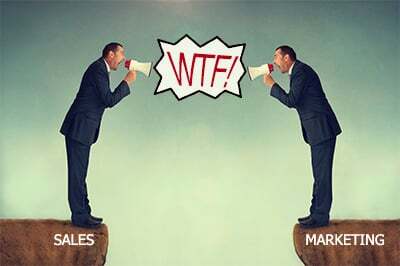 So WTF is SMarketing? Like most things that bring together two apparently disunited factions for the better, it's common sense really.